What makes celebrities different from other people? Nothing really. They're just people who know how to use the Law of Attraction. But it is something that you can learn to master so that you too can stand out in the crowd! Celebrities didn't become famous and successful because they were lucky. 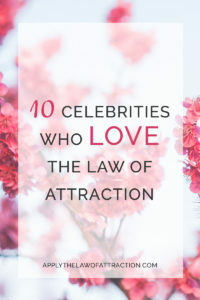 They became famous and successful because they used the Law of Attraction, even if they didn't know they were using it. You have the same ability to use the Law of Attraction to change your life. 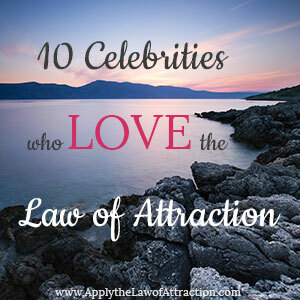 Here are ten celebrities who have used the Law of Attraction and love it! Will Smith is an American actor, producer and rapper. In the video below, he shares how he uses the Law of Attraction. His belief and passion come through so strongly, you can't help but smile. Jim Carrey is a Canadian-American comedian, actor and producer. He credits the Law of Attraction for helping him achieve the success he has today. In the following video, Jim shares how he used the power of intention and visualization to launch his film career and earn $20 million per movie. Oprah Winfrey is an American talk show host, actress, producer, and philanthropist. She has spent years teaching people about the Law of Attraction and how it changed her life. She has used her television shows to promote The Secret, the author Eckhart Tolle, and many others. In the video below, Oprah tells Larry King how she used the Law of Attraction to gain her Oscar-nominated role in the movie, The Color Purple. Tyler Perry is an American songwriter, actor, director, playwright, screenwriter, producer, and author. He created the following video to give you concrete tips for using the Law of Attraction to transform your life. In it, he reveals how he used the power of focus and belief to go from no one showing up at his play to the fame and success he has today. Jay Z is an American rapper, record producer and entrepreneur. In the video below, he shares how he used the Law of Attraction in his life and to create a successful career. Kanye West is an American Rapper, record producer and fashion designer. Here, he reveals how his fame and success are a result of his beliefs about himself and life. He also discusses how to handle negativity. Please note that he does use profanity in this video. Arnold Schwarzenegger is an Austrian American bodybuilder, actor, producer, director, entrepreneur, writer, and politician. In this video, Arnold shares his journey from Mr. Olympia to Mr. Universe to Actor to Governor. He discusses the importance of vision, visualization, and the power of your mind. This is a must see! LMFAO are an American rap duo (uncle and nephew). In the following video, they reveal how they are obsessed with the Law of Attraction, providing tips on how it works. Lady Gaga is an American singer, songwriter and actress. At 6:30 in the following video, Lady Gaga discusses using affirmations to change your beliefs and create the life you desire. Steve Harvey is an American actor, comedian, talk show host, game show host, and author. In this video, he shares how the Law of Attraction is a common sense principle of success that has helped him get to where he is in life. I ‘d like to study this program. I am deeply and seriously taking what ever information as part of my study in philosophy. Thanks for sharing. Good luck with your blog!